A German breakfast tends to look very different than the typical morning fare in North America, although a few things are very familiar. The lightly sweet and grain-rich Muesli takes the place of all of those heavily sweetened boxes cereals, while boring toast is replaced by an endless variety of freshly-baked rolls and breads of many shades and textures. To cover those delicious breads, in addition to butter, jam, honey and Nutella, there will often be a variety of meats and cheeses to choose from. Although those selections make for a wonderful breakfast, they don’t make for very exciting recipes. 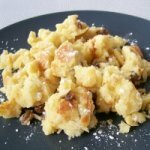 The recipes I have added here, although not traditionally served as breakfast in Germany, fit nicely into the North American breakfast mold. Feel free to prepare these items for lunch, dinner, or as dessert. In Germany or Austria, you might see them at any time throughout the day, even occasionally at breakfast. This Palatschinken recipe really serves as the foundation for a variety of wonderful German desserts, when filled with everything from Nutella to Topfen, but can also make for a great breakfast treat as well. We would sprinkle them with cinnamon and sugar and roll them up as finger food or fill them with jam or canned fruit with cottage cheese, but the possibilities are endless. You can even fold them in quarters and top them with butter and maple syrup. 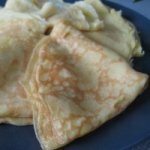 When my dear Imke first made this Apfelpfannkuchen recipe for me, I knew I had to add it to my site. 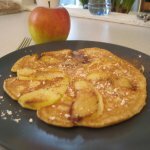 These German apple pancakes are a delicious treat at any time of the day, but do make for a particularly wonderful breakfast.